Preheat oven to 160°C/320°F. Place the rice in the base of a 7 cup-capacity shallow ovenproof dish. Combine the milk, vanilla bean and seeds, sugar and lemon zest, pour over the rice and stir to combine. Cover tightly with foil and place on a baking tray. Bake for 1 hour, remove the foil and stir. Bake, uncovered, for a further 30 minutes or until al dente. Make honeyed apples: heat a large frying pan over high heat. Cook the apples for 1 minute each side. Add honey and cook for a further 1–2 minutes or until golden and caramelized. Divide the rice pudding among 6 bowls, dust with the cinnamon, top with the apples and serve. I have been in a comfort food mood, too. But hey, it's winter = perfect mood for it. It's summer here so I'm not in comfort food mode, but that's a keeper for this fall--sounds so good. I love rice pudding but haven't made it with apples. This looks soooo good. Especially with those apples! I might just have to try those by themselves for snacking. Those apple slices look really pretty! I don't think I could ever slice that perfectly. Rice puddings are a favorite of mine, though I tend to leave them for winter. And yours look SO inviting with those apple slice beauties! 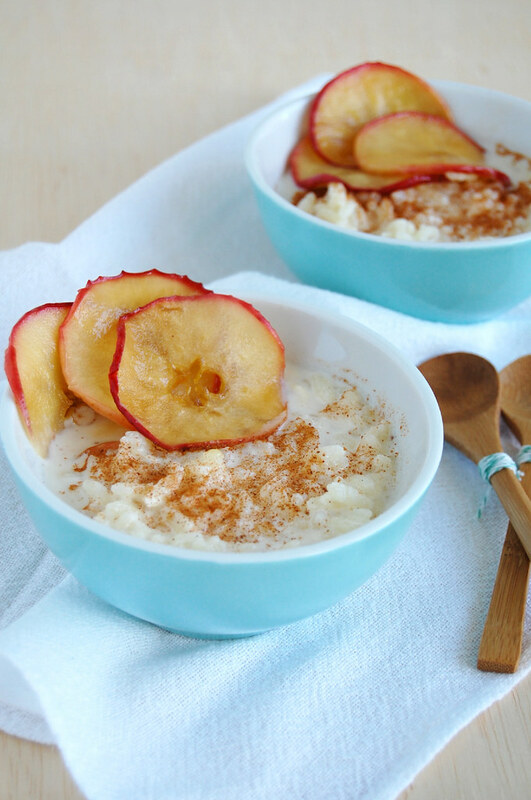 I love a good rice pudding the spiced apples make a nice compliment to the creamy rice pudding! add apple is great idea,i'll absolutely try this.. I love custard and porridge of all types. This looks perfectly rich and satisfying. Poppyseed, I hope you give these apples a try! Amanda, thank you! Hope you enjoy them! Pepela, thank you! I do hope you try it! This sounds so delicious! I haven't had rice pudding in years and the apples are such a perfect addition.